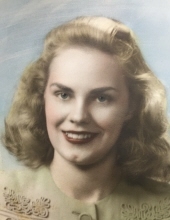 HALL, Jeanne Elizabeth -- Age 94, of Flint Township, died September 12, 2018. No formal service will be held. Visitation will be 4-7 PM Monday September 17 at Sharp Funeral Home and Cremation Center, 6063 Fenton Rd., Flint. Those desiring may make contributions to the Salvation Army. Jeanne was born March 27, 1924 in Flint the daughter of Dellis and Mae (Tubbs) Crane. She married Earl A. Hall in Wyoming he preceded her in death in 2011. She was a volunteer for McLaren Auxiliary for over 50 years. She was active with the Lions Club. She was very family oriented. She is survived by her children, Craig Hall of Flint Township, Chris ( Kimberly) Hall of Flushing; grandchildren, Julie Hall, Jeffrey (Rachel) Hall, Michelle (Austin) Stillman; great grandchild, Jace. She was preceded in death by her parents, husband, sisters, Janie, Margaret, Madeline, Joanne; brother, Ralph. Tributes may be shared at www.sharpfuneralhomes.com. To send flowers or a remembrance gift to the family of Jeanne Elizabeth Hall, please visit our Tribute Store. "Email Address" would like to share the life celebration of Jeanne Elizabeth Hall. Click on the "link" to go to share a favorite memory or leave a condolence message for the family.